Health needs even more watching than last month, espe­cially after the 22nd. The problem seems to be overwork, hyperactivity. You flit from one activity to the next with nary a break. Everything is go-go-go. A lot of this has to do with the career. On the 22nd you enter a yearly career peak and so you are very busy and taking on more responsibilities. Many busy people think that if they push themselves they will achieve more. But this is not usually the case. When work is done from a tired state it generally has to be redone. More mental mistakes happen. So the advice is simple: rest when tired. Enhance the health by giving more attention to the small intestine until the 9th and to the kidneys and hips from the 9th to the 29th. Hip massage will be powerful then. Be espe­cially careful from the 15th to the 17th. Take it nice and easy then; spend more time at the health spa, get massages. Watch the driving. Foreign travel is not so advisable; reschedule it for a better time if you can. There is good career success happening all month. A meeting or discussion with a boss or superior goes well between the 12th to the 14th - there is good communication between you. The superior seems open to your ideas. He or she could have some good ideas for you as well. 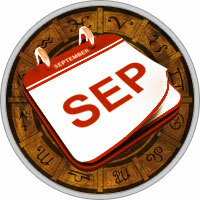 Venus trav­els with Saturn from the 17th to the 20th, which shows career success and elevation. You are in favour with your superiors. good career opportunities pursue you. Venus's trine with Jupiter on the 27th and 28th also brings success and opportunity. The family situation has been unstable all year. Emotions run high in the family, especially between the 7th and 11th. Be more patient with family members. Finances are still stressful. You will get through the month but reaching your financial targets requires more work and effort. Right now, career - your status and profes­sional life - is more important to you than money. Perhaps you are not giving finance the attention it deserves. Over­spending still seems a problem. Continue to work for mental clarity. You remain in a very spiritual period. You easily access the invisible world. There are all kinds of spiritual help and support available to you and this will help you get through the month.